We flew to Portland yesterday. On Alaska. From Fresno. You know, the flight was very scenic with cloudy skies and the Sierras stretching along the state of California like a giant dragon…spikes snowed-covered. We all take so much of this for granted, don’t we? It is wonderous. One of the main reasons for the visit is to be with family….make that the main reason is to be with family. We have a quite a few relatives and it makes the trip so much fun to visit everyone. On April 15, 2012 Leyla was born. She will be six. 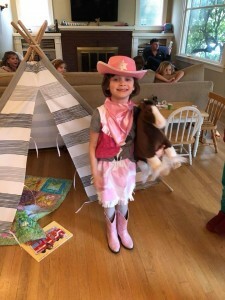 My objective was to help celebrate the event with a cake and a shopping trip to the western store in hopes of buying her a pair of cowgirl boots. After all, a six year old diva needs boots. What a trip to the store. She immediately saw and desired a pair of boots with lights. And of course, they didn’t have her size. This caused Leyla to want them even more. We had her try others on for size. After near-tears, we agreed to order them. And that was about the time that she decided she did not want to wait for FedEx to deliver them. So, the plain pink ones became at once more acceptable. We all know how that feels. After spending about an hour in the store, we left with pink boots in hand. She made a very good choice. And all was well with the world. Tears avoided. Such fun. This a.m. was the time for the cake “project”. Leyla was asked what kind of cake she desired, and it was determined to be a chocolate cake with vanilla icing. This girl has great taste and she knows her mind. Two traits I am confident will take her far in life. Being the cook and collector of recipes, I had come to Oregon armed with recipes. And so this morning recipe review was front and center with my cousin, Sue (I call her Susie). First thing she exclaimed was, “My god, this cake calls for 4 cups of sugar.” I had not noticed that when I picked out the recipe. Oh, well, I never use all the sugar a recipe calls for so I offered that up as a comment. Sue took exception to something else…I can’t remember what but it was enough that I figured I should look for another recipe. So, I picked out another one and there was something askant with at one too. Can’t remember what. Doesn’t really matter since I then took to the internets and found yet another recipe from Fine Cooking. That one seemed to be acceptable. And so it was settled. The guys went to the grocery store and bought a few ingredients she was missing. And when they returned cooking commenced. Sugar, butter, flour, what could go wrong? Well, the recipe called for 3 cake pans. We had two. So, I cooked two, reserved batter and cooked the third after the first two had cooled. No big deal. However, Sue, was aghast as how “small, unrisen” the cakes appeared. She called them cookies. Huffing and puffing may have ensued. She made me so worried, I offered to do another cake. 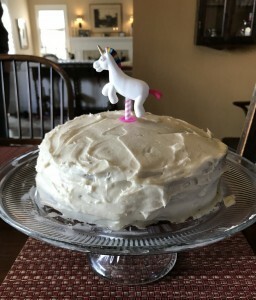 She offered to make her favorite cake from her Mom’s collection. And the more the conversation transpired the funnier it became. Really, folks, it was just a cake. A flat cake. But a cake. So, out of desperation, Rayman found a picture of the cake and it looked skinny. So, we all relaxed with the skinny cake and walked to lunch. Upon returning from the pub, I went about frosting the cake. No story there. So, now the cake is done. I post it here for your consideration. Complete with unicorn and Leyla!! For the record, it was 1-2 cups of oil in the second cake recipe. And I called the flat cake layers pancakes, which indeed they were both functionally and literally. You didn’t mention I acknowledged the cake had good flavor. I still believe a cook with your expertise needs to pick a chocolate cake recipe and stick to it, perfecting it over time. Just sayin’. Love, your cousin Susie.